CSUN President Dianne F. Harrison and film professor Nate Thomas arrive at the Hollywood Foreign Press Association’s annual grants banquet, where the university was awarded $60,000 to support film students. Photo courtesy of Nate Thomas. The Hollywood Foreign Press Association (HFPA) has awarded California State University, Northridge $60,000 to support the university’s film students. The gift was announced at the association’s annual star-studded grants banquet, held Aug. 9 at The Beverly Hilton in Beverly Hills. Among those in attendance were Alfonso Cuaron, Alfre Woodard, Amber Heard, Ben Hardy, Billy Porter, Charlize Theron, Cody Fern, Connie Britton, Dakota Fanning, John Cho, John David Washington, Rami Malek, Regina King and Steve Carell. William H. Macy served as the evening’s host. 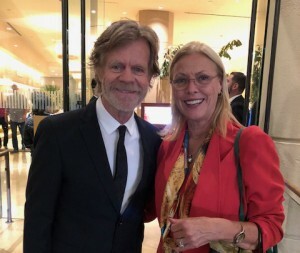 CSUN President Dianne F. Harrison with actor William H. Macy, who served as host of the Hollywood Foreign Press Association’s annual grants banquet. Photo courtesy of Dianne F. Harrison. In 2015, HFPA gave CSUN’s Department of Cinema and Television Arts $2 million to support students, including the creation of a Hollywood Foreign Press Association scholars program, and to enhance technology. HFPA, which is made up of international journalists who report on the entertainment industry and hosts the Golden Globe Awards each year, handed out a total of $3.25 million in grants at the Aug. 9 banquet to a variety of entertainment-related and charitable organizations. The donations were for a wide range of projects, including film preservation, higher education, training and mentoring, and the promotion of cultural exchange through film. CSUN’s relationship with the association dates back to 1996. In addition to the $2 million gift, HFPA grants over the years have supported student film projects and helped keep CSUN’s film program current with the latest technology. Students edit in the Hollywood Foreign Press Association Senior Film Edit Suite on campus, and they work on sound design in a state-of-the-art sound mix facility made possible by a grant from the association. CSUN’s Department of Cinema and Television Arts, housed in the Mike Curb College of Arts, Media, and Communications, has an international reputation for producing dedicated and talented entertainment industry professionals who recognize the value of hard work as they learn and continue to perfect their crafts. The department currently enrolls abut 1,550 undergraduate students and 30 students in its graduate screenwriting program. Its alumni work in all aspects of entertainment media, from writing, producing and directing to manning cameras and having the final say in what project is made. The entertainment trade magazines Variety and The Hollywood Reporter regularly list CSUN as one of the top film programs in the world.